Maintain communication – Develop an automatic company branded drip marketing program that is a highly personalized and designed to generate leads, get referrals, and up sell and cross sell without being too pushy. Design the program to elicit direct customer feedback in ways that are convenient for your past customers to provide. Use special occasions – Seasonally based businesses, and even those that aren’t, can optimize holidays and other occasions like back-to-school time to send email marketing campaigns to engage past clients. Brainstorm the ways your service-based business can take advantage of these occasions, like sending out a discount for HVAC maintenance in the fall, end-of-season automotive clearance events, and so forth. According to some experts, a customer who’s new to your business is likely to revisit your business only 5 percent of the time, and just 3 percent of those customers will buy from you a second time around. Track shopping carts – Online businesses or those with an Internet presence can track when a customer abandons the shopping cart. A simple message — even one sent through an auto-responder — is delivered, you begin communication with the customer and put your business back on his or her radar, increasing the likelihood that the customer will return to your site and make a purchase. 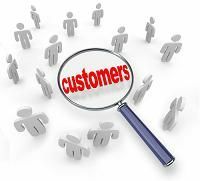 Track behavior – Keep track of questions or services your customers show interest in, and then send past-client marketing email messages to alert them to specials, discounts or other related offers to direct consumers back to your business. Use social proof – Incorporating social proof in the form of testimonials can really boost your past client marketing campaign. Gather testimonials from reviews on your website, tweets or Facebook postings and include them in your email campaign.